THE VOYAGES AND ADVENTURES OF M/Y INCOGNITO! : FINALLY A BLOG POST! Basse Terre, Guadeloupe.. FINALLY A BLOG POST! Basse Terre, Guadeloupe.. I apologize for the EXTENDED blog delay! I had to learn some computer "coding" in order to get its "sea legs" back on track. 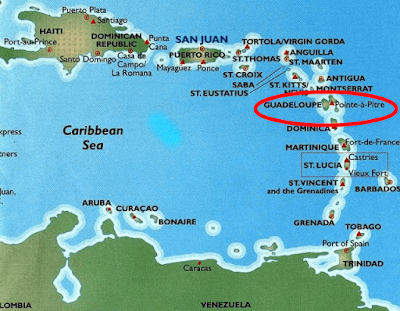 So now without further adieu, here are our adventures in Basse Terre, Guadeloupe.. The French West Indies are über special! 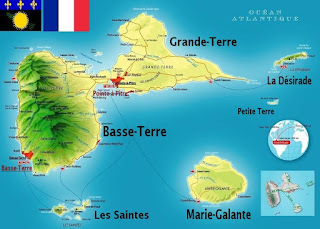 Basse-Terre is a French commune in the Guadeloupe department of France in the Lesser Antilles. It is also the prefecture (capital city) of Guadeloupe. The city of Basse-Terre is located on Basse-Terre Island, the western half of Guadeloupe. We set out to explore the other side of this butterfly shaped isle...Basse Terre. This map will help you visualize the butterfly shape. I feel like Willy Nelson. and went to check out the sitch... Our über fancy rental car in tow. It's a struggle just to rent a car quite often on these islands. They reserve them, and rent them out from under you when you arrive...that's what happened to us and it was also written all over the travel blogs about this area. A bit of a challenge, but we tackled it! Bish decided it was time to take a dip in the communal watering hole. The view across the island was breathtaking. Next up was their local zoo. I love foreign zoo's...they can be quite exotic and often don't have the rules & regulations we would normally see in the US. My #1 so far is the rogue zoo in Puerto Vallarta if you find yourself in that area. You can do crazy things like feed a giraffe with a carrot in your teeth.. This zoo in Guadeloupe was so well planned out. I had a feeling that we wouldn't be seeing anything too "rogue" here. The zoo was well laid out and nicely done. We were impressed and expected something much more rustic, but then again it was part of France and those French always do everything so well esthetically. The elevated pathways were well built and marked. This little guy sang his heart out. It was definitely smack in the middle of the rainforest. Hmmm..not sure how I feel about this creepy crawly part. Ugh, the suspension bridge of death was before us. Bish went first. Who's the smart one now? some wild animals in a jungle? Shoot me. I prefer a different kind of crazy. A few lemurs wanted to come out and play, but an electrical fence hindered them thank goodness. I've entitled it "crouching tiger, hidden dragon". This jaguar was ginormous. Glad he was asleep. His biceps scared moi. This monkey was ready for his close-up. Banana plantations abound on this part of Guadeloupe. Fire in the hole. Another one of God's magical sunsets. Dinner at Sea Berry in the marina. had to guess what was on the menu due to it all being in French. We never knew what would come out of the kitchen when we ordered, and it's always hysterical!